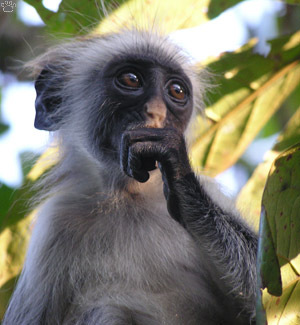 Zanzibar red colobus (Piliocolobus kirkii), Jozani Forest Nat'l Park, Tanzania. Travelling independently in East Africa is always an adventure, but not of a kind you might expect. 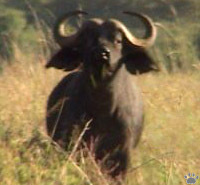 You can skip the adventure part altogether by signing up on an expensive safari, as virtually all tourists do. As always, it's much more interesting to travel on your own, but in East Africa this process involves constant fighting against nonstop attempts by 60% of local population to rip you off in some legal or illegal way. After just a few days, you develop habits of looking the other way when called, and being generally aggressive with all people you don't know personally. The details differ between countries: in Rwanda and Burundi, many local people plainly say "Give me money!" instead of "Hello!" In Kenya and Tanzania, they start with "Hello, my friend!" and the rip-offs get slightly more sophisticated, but also more difficult to avoid. Uganda is only marginally better. It gets worse than in any of more than a hundred countries I've been to. Ngorongoro Crater, Tanzania, used to be the best wildlife viewing place in the world. Now it's overrun by hordes of tourists, and, as a result, overregulated. Gorge Museum) . 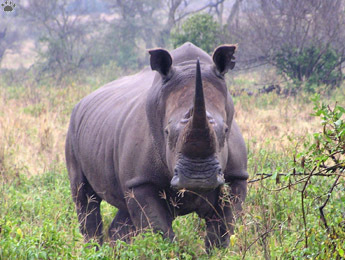 But these hardships are worth enduring, because East Africa is a place every naturalist has to visit in his lifetime. One reason is that it was possibly the very area where our species has evolved. 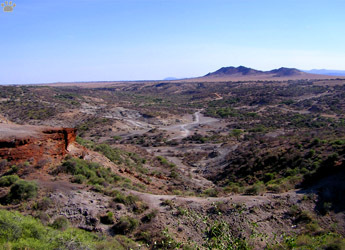 Olduvai Gorge in Ngorongoro Conservation Area, Tanzania, and Lake Turkana region in Kenya are the most important early hominid fossil sites in the world - at least for now. really good for removing meat from bones. 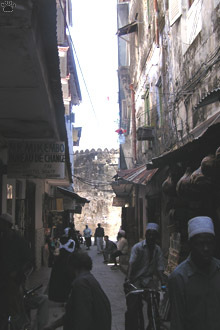 Stone Town, Zanzibar, was a major slave trade hub. Much later, East Africa became the global center of slave trade for many centuries. The industrial slave trade was developed by the Arabs and later taken over by the Europeans. Tragic as it was, it helped preserve the wildlife by somewhat relieving population pressure. Eventually, most of the region became British colonies. It still has good infrastructure, and people are relatively well-educated; they also have "the colonialists" to blame for all their problems. As for Rwanda and other former French colonies, their main legacy is civil strife and rabid Catholicism (the French encouraged conversions by selling only non-Christians into slavery). 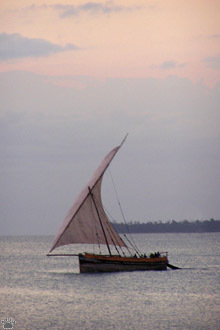 Dhow, a traditional Arab boat, Zanzibar. 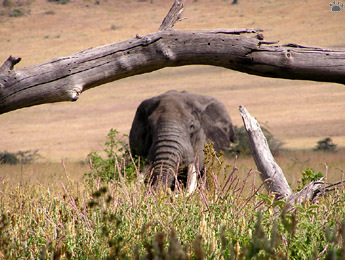 African elephant (Loxodonta africana), Ngorongoro Conservation Area, Tanzania. African elephant and red-billed queleas (Quelea quelea) , Ngorongoro. Kenya. 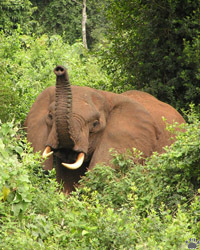 Of course, the main reason to visit East Africa is another colonial heritage - its National parks. They are the last place on Earth where the density and diversity of megafauna (very large animals) are almost as high as they'd been before humans destroyed it worldwide. 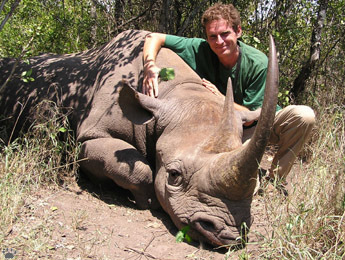 East Africa has probably avoided the mass extinction until now because animals here have co-evolved with the humans. hold on to it to follow the adults. Nairobi NP. Elephants marching towards Mt. Kilimanjaro. 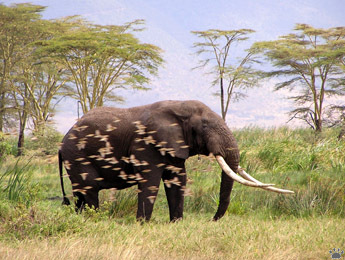 Amboseli Nat'l Park, Kenya. 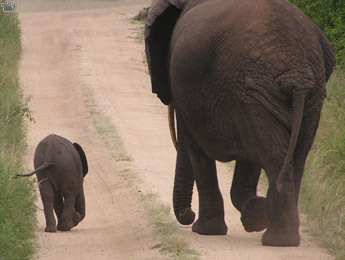 On the road, Queen Elizabeth Nat'l Park, Uganda. sniffing the air to pick up the scent. 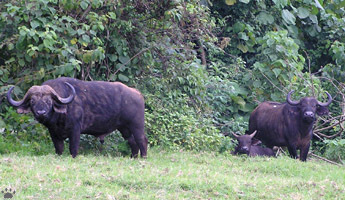 Aberdare National Park, Kenya. Presence of large animals gives park officials the excuse to charge you for obligatory guides or even armed guards. You are also not allowed to travel on foot (something local Maasai and other tribespeople do all the time), or to drive around at night. Lions are the species that makes tourism bureaucrats the most paranoid. 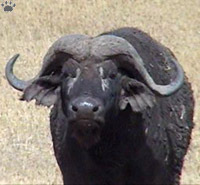 If there are no lions, the "dangerous animals" are usually elephants, buffalo, rhinos, and hippos. This is nonsense: all these animals can be safely approached if you carefully watch there reaction and don't push it too far. 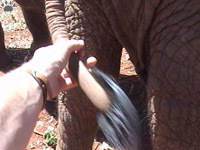 Accidents usually occur when tip-hungry "guides" drive safari vehicles too close to animals. was a bit nervous, but not aggressive. Aberdare. 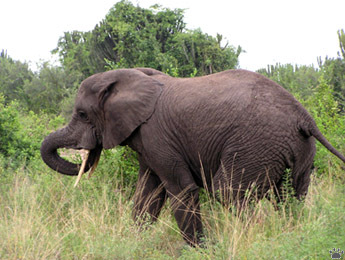 Elephant charging a safari minibus after being closely followed for half an hour. The guide in the bus was a park ranger. Queen Elizabeth NP. 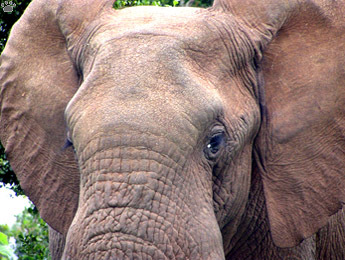 elephants without much risk. 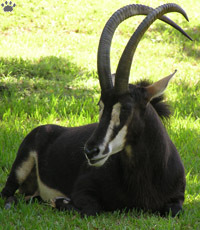 Ngorongoro. very shy. 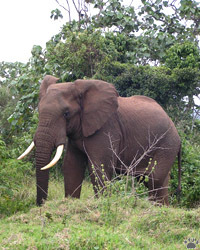 Nairobi NP. In some places, buffalos and hippos routinely graze inside campgrounds every night, never causing any problems, except for an occasional torn tent rope. 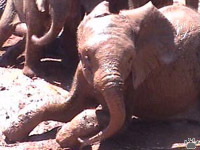 All this "dangerous animals" scheme is just part of a shameless state-run extortion racket into which the protected Natural areas systems of Kenya and Tanzania have evolved. Rwanda and Uganda are following their example. 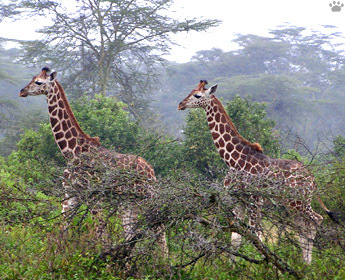 National parks of East Africa are already the world's most expensive, and fees go up every year. ears: as long as they are wide open, you are safe. Buffalo family waiting for nightfall at the edge of a campground. 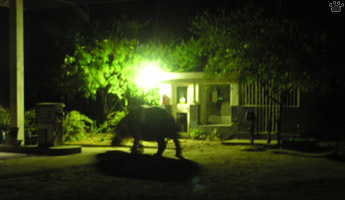 Hippo (Hippopotamus amphibius) walking through a gas station at night. easily domesticated. 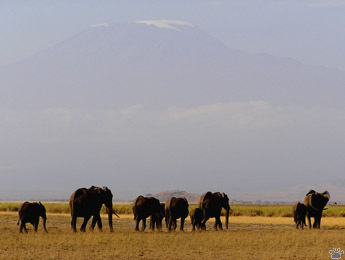 Amboseli. Some Tanzanian parks already charge $100 per day, which means $500-800 per day if you consider obligatory guide/porter fees, car rentals (you can't rent a car without a driver), huge tips which are usually demanded rather than expected, unavoidable camping fees (even if you sleep in the car), fuel costs etc. Where do these millions of dollars go, is not a secret to anyone. The parks still have poor infrastructure and often really bad access roads, the stuff is underpaid, the guides and porters are dirt poor, but streets around government offices in Dar es Salaam and Nairobi are all full of expensive SUVs. foot than by car. 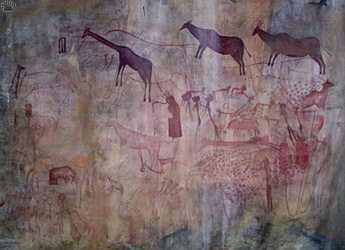 Mikumi Nat'l Park, Tanzania. more approachable. Lake Nakuru National Park, Kenya. unpredictable - a mindless killing machine. 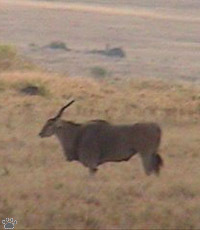 Sweetwater Game Sanctuary, Kenya. Local people on all levels of society usually see any white person as a source of unlimited cash. Your only purpose of existence is to give money to Africans - who by definition are more worthy of it. I think it's pure racism. 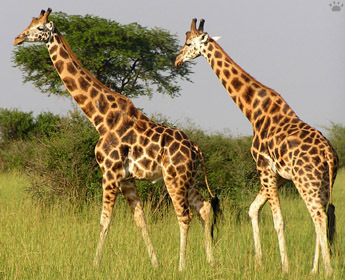 Rothschild's giraffes (G. c. rothschildi), Murchison Falls Nat'l Park, Uganda. 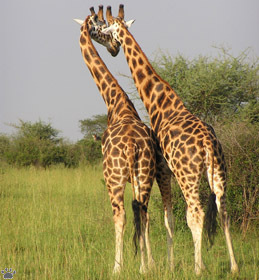 Kissing Rothschild's giraffes, Murchison Falls NP. So if you try to really see East Africa on a reasonable budget, you will surely have plenty of adventures- sneaking into National parks without a ticket, walking around at night with the moon for flashlight, doing a lot of things you are not supposed to do, but have to. You will sometimes get caught, probably. But you will get to places no tourist has gone before, and find animals few people have ever seen. I think it's worth the trouble. 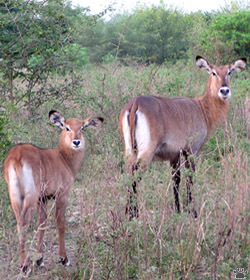 Waterbucks (Kobus ellipsiprymnus), Queen Elizabeth NP. 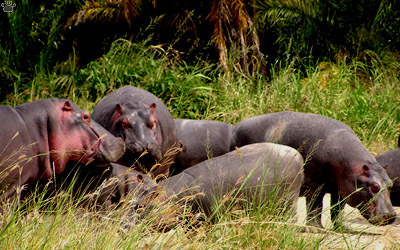 As the night approaches, hippos leave their ponds, lakes and rivers, and walk ashore to graze.